In November 1918, the world welcomed the end of four years of man-made death and destruction — but by then, a deadlier enemy was already stalking the globe. Through a confluence of wartime censorship, increased travel by ship and rail, poor understanding of hygiene and overcrowded conditions in cities, the so-called “Spanish flu” spread swiftly, killing anywhere from 10 to 20 per cent of those it infected, most of them otherwise healthy adults. No country or region was spared; cases were recorded from the South Pacific to Alaska. In Canada, nowhere was the disease deadlier than in the isolated Inuit communities of northeastern Labrador. 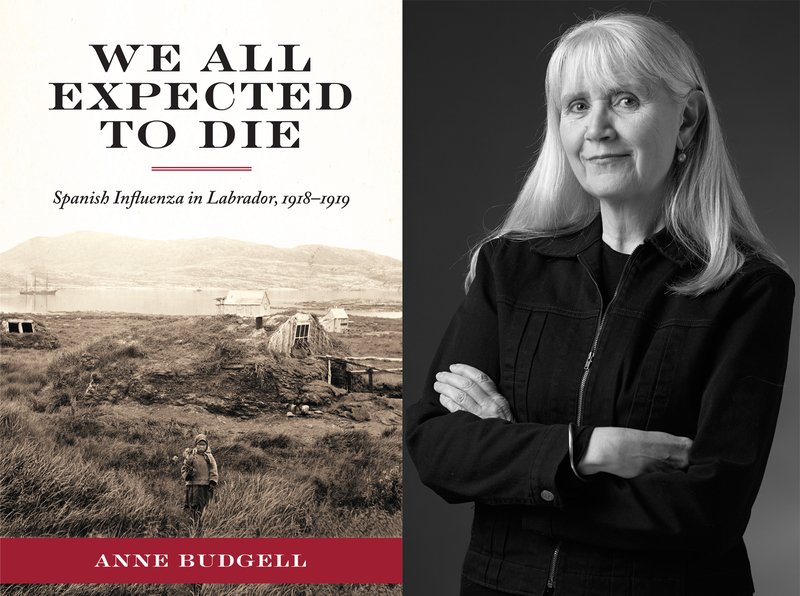 In a new book, We All Expected to Die: Spanish Influenza in Labrador, 1918-1919, available now from ISERBooks, journalist and documentary filmmaker Anne Budgell traces the sad history of the pandemic in places like Hebron and Okak, where the mortality rate was 71 per cent. Drawing on the recollections of survivors, diaries, newspaper clippings and government documents, the book is both a haunting account of the pandemic and a testament to human endurance in the face of unimaginable suffering. In the following excerpt from the book, the Moravian supply ship Harmony arrives at Hebron, carrying the seeds of death. At Hebron, the Harmony anchored in the bay, because of rocks and shallow water. The work of unloading and then loading again could take a long time, with the slow transfer of every barrel and package. Sometimes, men from Nain came on the Harmony to Hebron to assist, but that was not the case for the last trip of 1918, when the ship sailed directly to Hebron. We were really happy because the Harmony used to bring food and other supplies. But this time when it came it was carrying a really sick person. The Captain of the Harmony told our minister, Bishop Martin, to tell all the Inuit not to go to the front of the ship where the sick person was. A lot of Inuit didn’t listen and went to the front anyway because they liked the Harmony so much. They were so happy some of the people were even running around on the Harmony. If a proper warning about sickness had been issued it would have been taken seriously, as Martin had been in Labrador long enough to know how deadly flu could be. He made a note in his diary on 2 November to say the Harmony had arrived five days previously on a Sunday morning; everyone left church to meet the vessel and to help with the freight, Martin said, and “We had to postpone the sermon till the afternoon.” He did not mention anything about a sick sailor, saying only that “she loaded and unloaded on the following days.” The Harmony went to Saglek on 1 November for a single night and returned to Hebron on 2 November. Joshua Obed said the Harmony, on the way to Saglek, towed his parents’ boat to their camp. As an elderly man, he recalled an unusual thing that was not recorded at the time. Obed said when the Harmony was departing Hebron, the ship’s horn blew three times and the cannon was fired. “The Captain told our minister that he blew his horn and fired his cannon because he thought it would be the last time he would ever see Inuit people. When our minister was telling the Inuit people this, I even heard him.” Obed said the sickness started just days later. My parents left Hebron to go netting seals, but as soon as they started putting out the nets they began to get sick. Since some of them were still able to work a little, they started to go back to Hebron. There was a sea on and they had to go sideways to the wind. They didn’t have a motorboat; the Harmony pulled them when they left, so they had to row back to Hebron. When they got to Hebron, they were too weak to unload the boat, so Willihattus, the brother of Harriet Nochasak, had to unload the boat by himself and right after he finished the unloading, he too got sick. As soon as the Harmony left Hebron, Abraham Kura and his wife, who had come for supplies, left to go back to their home in Napartok Bay. They only got as far as Manetuasuk and Abraham’s wife got so sick she was nearly dying, so they started to go back to Hebron. They had a little pup with them and they put him in the cuddy. When they got to Hebron, Abraham went to anchor the boat and while he was at the anchor, his wife died. Mrs. Kura was the first person to die of Spanish flu in Hebron. I think it was about a week after Mrs. Kura died that everyone seemed to start taking turns dying. When we were sick with the Spanish flu, we were really thirsty. Some people died with thirst. Samuel Angottak came to our house to see if he could get a drink of water. When his nephew said, “Sorry, we don’t have any water,” he just went out again without saying another word. How I pitied him, that poor old Samuel. I still see him today as though it just happened. I really felt love for him when he had to leave without even a drink because we didn’t have any water at all. I still think of old Angottak, his hair sticking right up with lice, poor old man. That time we were all sick, there was a man next to me in the bed, all of a sudden he started to lean up against the wall and then he fell dead on the pillow. My brother, even though he was sick, dragged that dead man to the door. Before my brother died everyone was sick and we were all so thirsty and there was no water. Later on I told my sister-in-law, “Jesus can make water come through the wall, hey?” When I said that she only looked at me lovingly. On the same night, just before daylight, I started to feel better. As soon as I felt strong enough, I put on my brother’s sealskin pants and his skin boots and went to get some water from the brook. According to Bishop Martin, the first death in Hebron from influenza was on 7 November, 12 days after the Harmony arrived and three days after it left to go to Okak. Anne Budgell is a former radio and television journalist. She wrote and co-directed the NFB short documentary The Last Days of Okak and is the author of Dear Everybody: A Woman’s Journey from Park Avenue to a Labrador Trap Line.